Government has said that it is firmly on course to achieve high growth of 8% plus as manufacturing, services and exports are back on good growth path. While GDP growth at 6.3% in the second quarter of 2017-18 signalled turnaround of the economy, growth in the second half is likely to remain between 7.2% to 7.5%. The Union Minister for Finance and Corporate Affairs Shri Arun Jaitley while presenting the General Budget 2018-19 in Parliament on February 1,2018, said that Indian society, polity and economy had shown remarkable resilience in adjusting with the structural reforms. IMF, in its latest Update, has forecast that India will grow at 7.4% next year in the backdrop of services resuming high growth rates of 8% plus, exports expected to grow at 15% in 2017-18 and manufacturing back on good growth path. Reiterating the pledge given to the people of India four years ago to give this nation an honest, clean and transparent Government and to build a strong, confident and a New India, Shri Jaitley said, the Government led by Prime Minister, Shri Narendra Modi, has successfully implemented a series of fundamental structural reforms to propel India among the fastest growing economies of the world. The Finance Minister said that Government has taken up programmes to direct the benefits of structural changes and good growth to reach farmers, poor and other vulnerable sections of our society and to uplift the under-developed regions. He said, this year’s Budget will consolidate these gains and particularly focus on strengthening agriculture and rural economy, provision of good health care to economically less privileged, taking care of senior citizens, infrastructure creation and working with the States to provide more resources for improving the quality of education in the country. He said, the Government has ensured that benefits reach eligible beneficiaries and are delivered to them directly and said that Direct Benefit Transfer mechanism of India is the biggest such exercise in the world and is a global success story. Referring to the Government’s commitment to the welfare of farmers and doubling farmers’ income by 2022, the Finance Minister announced a slew of new schemes and measures. He said, that government has decided to keep MSP for all unannounced kharif crops atleast one and half times of their production cost after declaring the same for the majority of rabi cops. He said, the volume of institutional credit for agriculture sector from year-to-year increased from Rs.8.5 lakh crore in 2014-15 to Rs.10 lakh crore in 2017-18 and he proposed to raise this to Rs.11 lakh crore for the year 2018-19. After the establishment of Dairy Infrastructure Fund, Shri Jaitley announced setting up a Fisheries and Aquaculture Infrastructure Development Fund (FAIDF) for fisheries sector and an Animal Husbandry Infrastructure Development Fund (AHIDF) for financing infrastructure requirement of animal husbandry sector with a total corpus of Rs.10,000 crore for the two new funds. On the lines of ‘‘Operation Flood’’ a new Scheme ‘‘Operation Greens’’ was announced with an outlay of Rs 500 Crore to address the challenge of price volatility of perishable commodities like tomato, onion and potato with the satisfaction of both the farmers and consumers. He also announced to develop and upgrade existing 22,000 rural haats into Gramin Agricultural Markets (GrAMs) to take care of the interests of more than 86% small and marginal farmers. These GrAMs, electronically linked to e-NAM and exempted from regulations of APMCs, will provide farmers facility to make direct sale to consumers and bulk purchasers. Moreover, an Agri-Market Infrastructure Fund with a corpus of Rs.2000 crore will be setup for developing and upgrading agricultural marketing infrastructure in the 22000 Grameen Agricultural Markets (GrAMs) and 585 APMCs. He said, so far 470 APMCs have been connected to e-NAM network and rest will be connected by March, 2018. Shri Jaitley announced Rs 200 crore for organized cultivation of highly specialized medicinal and aromatic plants and said that the organic farming by Farmer Producer Organizations (FPOs) and Village Producers’ Organizations (VPOs) in large clusters, preferably of 1000 hectares each will be encouraged. Similarly, allocation of Ministry of Food Processing has been doubled from Rs.715 crore in 2017-18 to Rs.1400 crore in 2018-19. Terming Bamboo as ‘Green Gold’, the Finance Minister announced a Re-structured National Bamboo Mission with an outlay of Rs.1290 crore to promote bamboo sector in a holistic manner. Under Prime Minister Krishi Sinchai Yojana-Har Khet ko Pani, 96 deprived irrigation districts will be taken up with an allocation of Rs 2600 crore. The Centre will work with the state governments to facilitate farmers for installing solar water pumps to irrigate their fields. He also proposed to extend the facility of Kisan Credit Cards to fisheries and animal husbandry farmers to help them meet their working capital needs. Shri Jaitley said India’s agri-exports potential is as high as US $100 billion against current exports of US $30 billion and to realize this potential, export of agri-commodities will be liberalized. He also proposed to set up state-of-the-art testing facilities in all the forty two Mega Food Parks. He also announced a special Scheme to support the efforts of the governments of Haryana, Punjab, Uttar Pradesh and the NCT of Delhi to address air pollution in the Delhi-NCR region by subsidizing machinery required for in-situ management of crop residue. On the loans to Self Help Groups of women, the Finance Minister said it increased to about Rupees 42,500 crore in 2016-17, growing 37% over previous year and expressed confidence that loans to SHGs will increase to Rs.75,000 crore by March, 2019. He also substantially increased allocation of National Rural Livelihood Mission to Rs 5750 crore in 2018-19. Referring to the measures taken for the benefit of lower and middle class, the Finance Minister said, under Ujjwala Scheme distribution of free LPG connections will be given to 8 crore poor women instead of the previous target of 5 crore women. Under Saubahagya Yojana, 4 crore poor households are being provided with electricity connection with an outlay of Rs.16,000 crore. To fulfil target of housing for All by 2022 ,more than one crore houses will be built by 2019 in rural areas, besides already constructed 6 crore toilets under Swachh Bharat Mission. Shri Jaitley stressed that the focus of the Government next year will be on providing maximum livelihood opportunities in the rural areas by spending more on livelihood, agriculture and allied activities and construction of rural infrastructure. He said, in the year 2018-19, for creation of livelihood and infrastructure in rural areas, total amount to be spent by the Ministries will be Rs.14.34 lakh crore, including extra-budgetary and non-budgetary resources of Rs.11.98 lakh crore. Apart from employment due to farming activities and self employment, this expenditure will create employment of 321 crore person days, 3.17 lakh kilometers of rural roads, 51 lakh new rural houses, 1.88 crore toilets, and provide 1.75 crore new household electric connections besides boosting agricultural growth. The Budget has given a big thrust to Medium, Small and Micro Enterprises (MSMEs) to boost employment and economic growth. A sum of Rs. 3794 crore has been provided for giving credit support, capital and interest subsidy and for innovations. MUDRA Yojana launched in April, 2015 has led to sanction of Rs.4.6 lakh crore in credit from 10.38 crore MUDRA loans. 76% of loan accounts are of women and more than 50% belong to SCs, STs and OBCs. It is proposed to set a target of Rs.3 lakh crore for lending under MUDRA for 2018-19 after having successfully exceeded the targets in all previous years. Reiterating that creating job opportunities is at the core of Government policies, Finance Minister cited an independent study as showing that 70 lakh formal jobs will be created this year. To carry forward the momentum created by the measures taken during the last 3 years to boost employment generation, Shri Jaitley announced that the Government will contribute 12% of the wages of the new employees in the EPF for all the sectors for next three years. He proposed to make amendments in the Employees Provident Fund and Miscellaneous Provisions Act, 1952 to reduce women employees' contribution to 8% for first three years of their employment against existing rate of 12% or 10% with no change in employers' contribution. The Budget proposed an outlay of Rs.7148 crore for the textile sector in 2018-19 as against Rs.6,000 Crore in 2016. The Finance Minister said that estimated budgetary expenditure on health, education and social protection for 2018-19 is Rs.1.38 lakh crore against estimated expenditure of Rs.1.22 lakh crore in 2017-18 . On education front, Shri Jaitley announced setting up of Ekalavya Model Residential School on par with Navodaya Vidyalayas to provide the best quality education to the tribal children in their own environment by 2022 in every block with more than 50% ST population and at least 20,000 tribal persons with special facilities for preserving local art and culture besides providing training in sports and skill development. To step up investments in research and related infrastructure in premier educational institutions, including health institutions, a major initiative named ‘‘Revitalising Infrastructure and Systems in Education (RISE) by 2022’’ with a total investment of Rs.1,00,000 crore in next four years was announced . He said that a survey of more than 20 lakh children has been conducted to assess the status on the ground, which will help in devising a district-wise strategy for improving quality of education. To improve the quality of teachers an integrated B.Ed. programme for teachers will be initiated. Shri Jaitley said, the Government would launch the ‘‘Prime Minister’s Research Fellows (PMRF)’’ Scheme this year. Under this, 1,000 best B.Tech students will be identified each year from premier institutions and provide them facilities to do Ph.D in IITs and IISc, with a handsome fellowship. 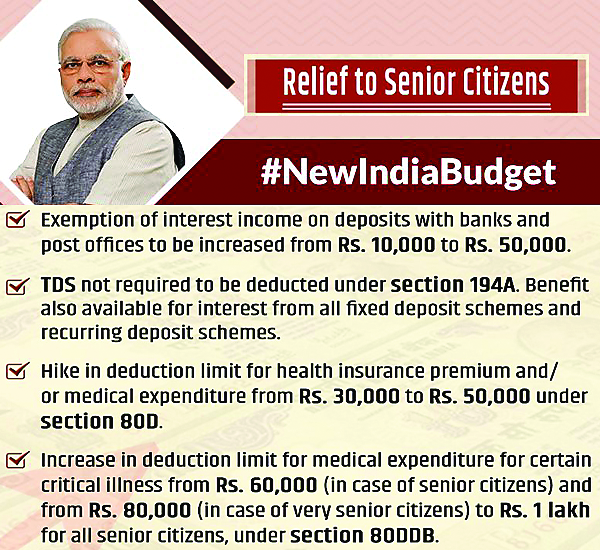 Allocation on National Social Assistance Programme this year has been kept at Rs. 9975 crore. The Finance Minister announced the world’s largest government funded health care programme titled National Health Protection Scheme to cover over 10 crore poor and vulnerable families (approximately 50 crore beneficiaries) providing coverage upto 5 lakh rupees per family per year for secondary and tertiary care hospitalization. He also committed Rs 1200 crore for the National Health Policy, 2017, which with 1.5 lakh Health and Wellness Centres will bring health care system closer to the homes of people. The Government also decided to allocate additional Rs.600 crore to provide nutritional support to all TB patients at the rate of Rs.500 per month for the duration of their treatment. Shri Jaitley said, the government will be setting up 24 new Government Medical Colleges and Hospitals by upgrading existing district hospitals in the country.